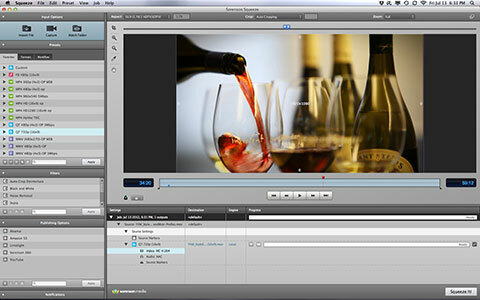 For many editors, the preferred video encoding application is Sorenson Squeeze. 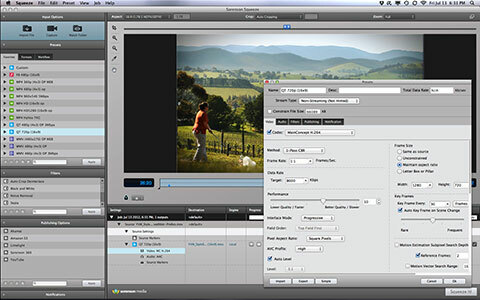 It’s one of the top encoders for both Mac and PC platforms and also comes bundled with Avid Media Composer in its third-party software package. Recently, Sorenson introduced the optional Pro version, which enables the encoding of Avid DNxHD MXF media, as well as Dolby Pro Audio and Apple ProRes QuickTime codecs (Mac only). Sorenson launched Squeeze 8.5 with more features and faster encoding, especially for users with some CUDA-enabled NVIDIA GPU cards. CUDA acceleration was introduced with Squeeze 7 and accelerates presets using the Main Concept H.264/AVC codecs; however, 8.5 also accelerates MPEG-4, WebM, QuickTime and adaptive bit rate encoding. Other new features include additional input and output formats, some interface enhancements and 5GB of permanent storage with the Sorenson 360 video hosting site (included with the 8.5 purchase). I use several different encoders and have always been a fan of Squeeze’s straightforward interface, which is organized around formats and/or workflows. Settings are easy to customize with granular control and modified presets may be saved as favorites. Although I typically import a few files, set my encoding requirements and let it go, Squeeze is also designed to allow import from a camera or work automatically from a watch folder. The workflow aspect is not to be overlooked. You can set up Blu-ray and DVD disc burns, upload to various web designations and include e-mail notification – all within a single encoding preset. Burning “one-off” review DVDs for a client is as simple as importing the file, applying the DVD workflow preset and loading the blank media when prompted. If you use the web for client review and approval, then it’s handy to have the Sorenson 360 account built-in. This is Sorenson Media’s video hosting site running on Amazon servers, thus giving you a reliable backbone. You may set up player skins and access controls to use the site as an outward facing presence to clients – or embed the videos into your own site. Aside from the improved speed and encoding quality of 8.5, the Pro version is a great front-end tool for video editors, too. For instance, if you don’t want to edit with the native media format, convert QuickTime files into Avid-compliant MXF media – or take Canon C300 MXF clips and convert them to ProRes for use in Final Cut. These new Pro features continue to enhance the Squeeze “brand” in the eyes of video editors as their top encoding solution.